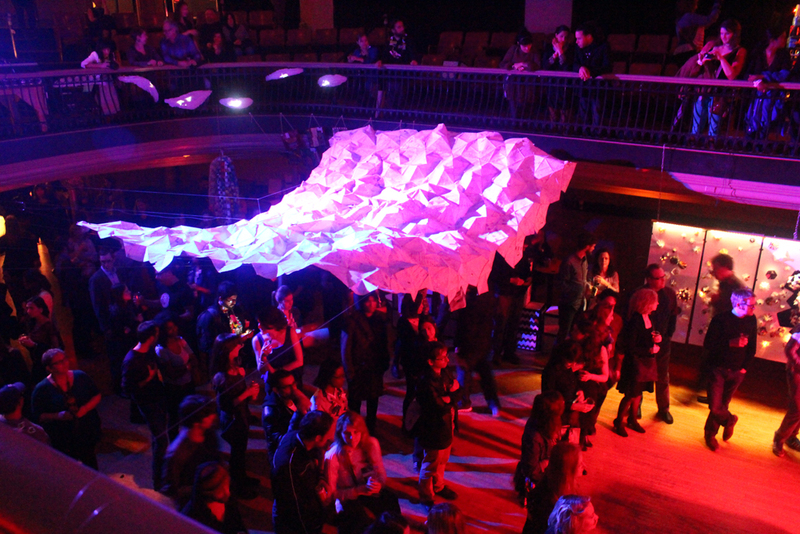 Every year artists, designers, and architects create installations out of discarded materials and reimagine the spaces where PULP: paper art party is taking place. 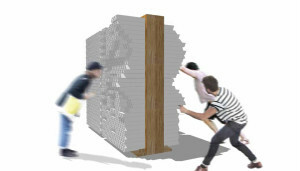 Artists are encouraged to come up with creative solutions for connecting and assembling their pieces without using common adhesives or anything that may destroy the materials’ capacity to be recycled or composted. 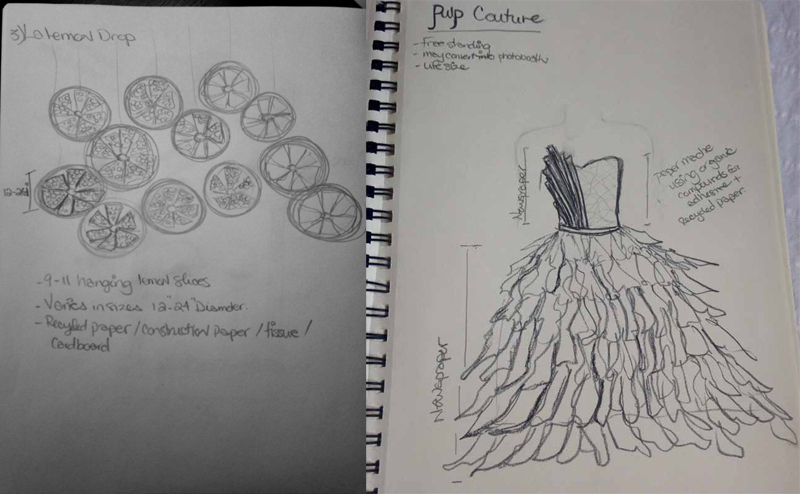 Below are a few of the sketches sent to us by artists to describe their installations. We will have at least 20 installations (if not over 20, we’re still receiving a few late submissions) by more than 40 artists. 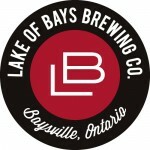 Keep checking this page as we will update it with more installation designs every few days. 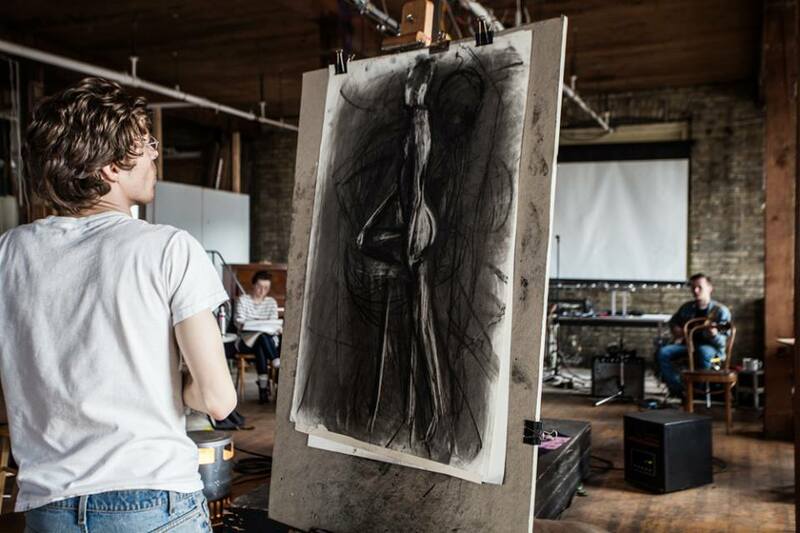 Using the most elementary of supplies – reclaimed paper and charcoal – Artist Stefan Berg will demonstrate a form of life-drawing at the PULP Paper Art Party. 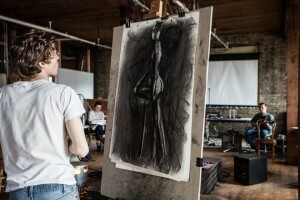 This performative drawing process will layer impressions and observations onto a single page, accumulating a unique document of time and experience. origami objects. Paper Poppers are assembled from folded pieces of paper modules. 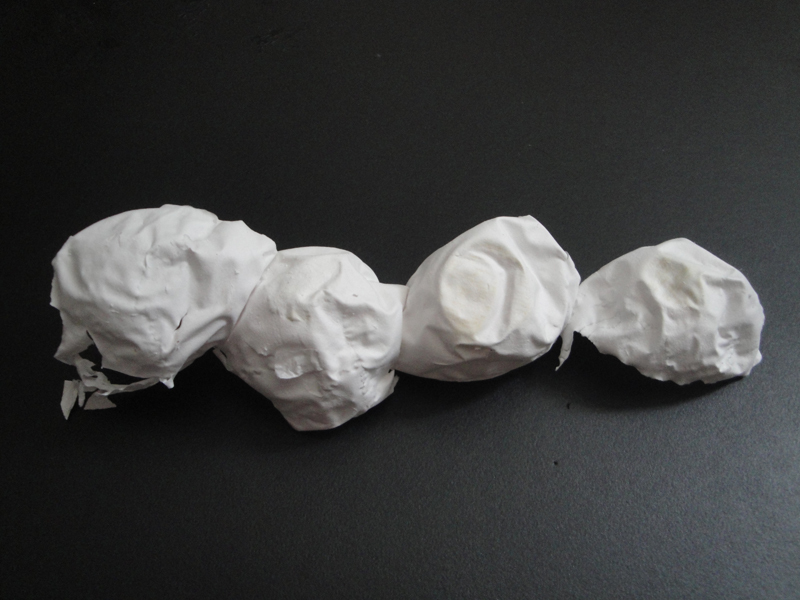 Each popper is comprised of 12 pieces that are folded and linked together to form its ball-like shape. 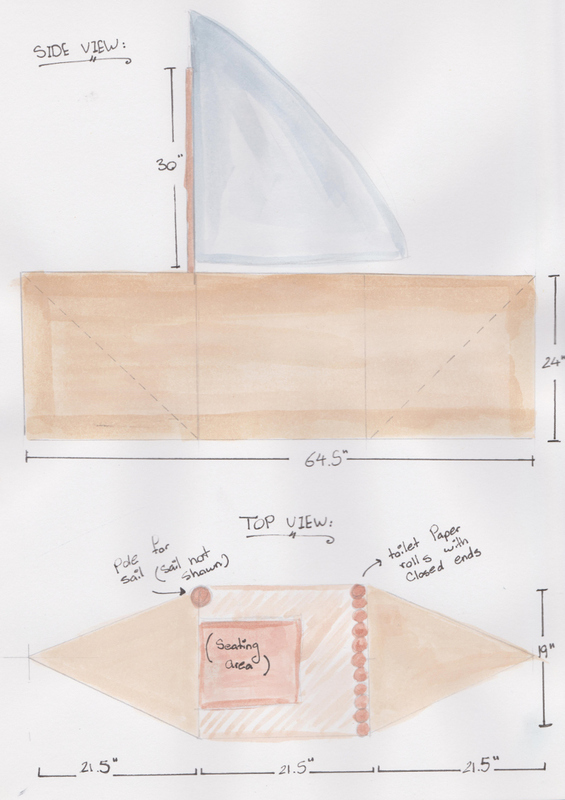 My submission for the PUPL paper party is a free standing boat structure. This boat is made from recycled cardboard boxes and held together with cable ties. The pole for the sail is a fabric cardboard tube. There will be a seating area in the middle of the boat and in front of the seat there will be multiple containers made from toilet paper rolls. In the containers the guests are encouraged to leave messages, and to respond to messages of other guests. This is a reference to S.O.S messages placed in glass containers and thrown in the sea, and encourages the guests to interact with the installation and each other (albeit indirectly). The sail will be made of light paper material woven together. We live in a society where there are million dollar complexes just around the corner to shelters made from cardboard. Where do we stand in the middle of it all? My contribution to this tale is a fantasy spin: what if you could take this sad situation of temporary paper homes and make them portable? What if you could float away? Step into our smoking room. Take off your top hat, pour yourself a glass of scotch, and sip it while reclining on a plush bear rug in front of a crackling fire. And then marvel in the fact that everything is made from reclaimed paper goods and is 100% recyclable. 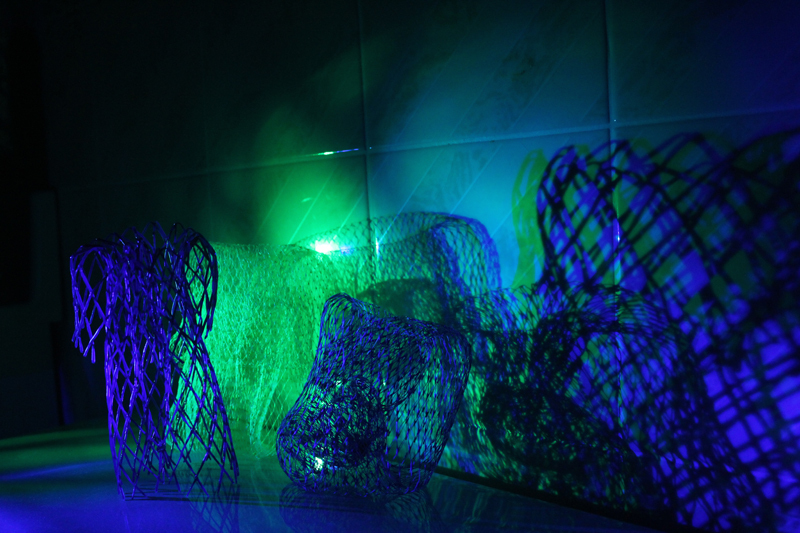 is an interactive sculptural installation. Stacks of folded paper cootie catchers are arranged to create an installation that emulates a forest, both visually and materially. The project title references an old adage, “Don’t lose sight of the forest for the trees.” That is, that one should not be so overwhelmed by details as to lose sight of the broader issue. This parallels many current discussions surrounding environmental issues. The design is based on the cootie catcher, a type of origami also known as a paper fortune teller. The cootie catcher engages two or more players in a game where one player holds and manipulates the cootie catcher, and the other selects which folds to open to ultimately reveal their fortune. Visitors will be able to select an individual cootie catcher from the stack, with the stacks gradually diminishing as the night progresses. Each cootie catcher will be folded from used paper. The nonblank side of the paper will be folded into the centre; when the cootie catcher is opened, the paper’s previous use – beautiful, mundane, or obscure – will be revealed. Instead of a message about their future, players will be faced with the paper’s past. Functioning as an interactive installation, the project will invite conversation amongst players about how paper is used and wasted, and the impact of their own environmental footprint on the future. 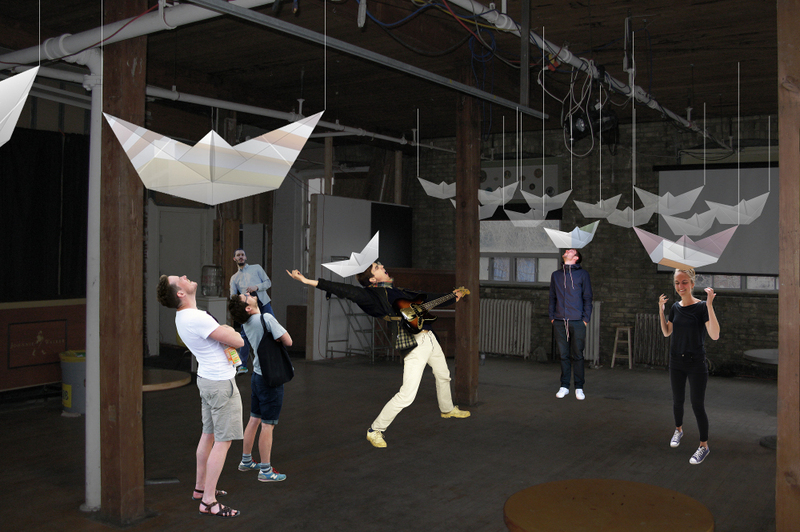 The idea for our installation involves floating hats/boats. We propose these objects start at the stair case and flow up and into the 2nd floor space, at the west end. There will be a lot of them in varying sizes, colorful and random. We can make them detachable from their hanging device and people can wear them/walk out with them. The boats are made from used paper from our office. Together with my dancers, Colleen Snell and Rebecca A. Bobrovskis, we will create a paper playground of sorts in a form of a dance and art performance. I plan to ‘create’ two paper creatures (the dancers) adorned in paper dresses that I will make on location along with a paper environment for them to dance within. The paper environment will be mostly hung using fishing wire. I am very much interested in experimenting with the sounds, rips, and, tares that the paper dresses will make while the dancers are in motion. Essentially the creatures will rip themselves out of the dresses. The idea is to do a call-and-response between the creator (me, the painter), thecreatures (the dancers), the musician/musical act, and the audience. Above is an image that most resembles the project that we are proposing for the Pulp Art Party. 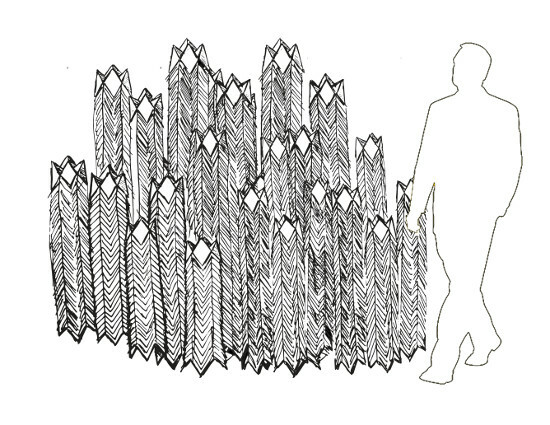 stalagmites/stalactites to form or collapse, creating a dynamic installation that is controlled by spectators.The installation will be dimensioned to allow spectators to feel immersed in the performance. The constantly-changing appearance of Stalagmite/Stalactite will further enhance the dynamic atmosphere of the party. A regular paper art party treat, Tanya will bring her unfinished comic book for party guests to fill in the blanks. Careful what you draw in there as Tanya may take these books to street festivals where children can draw in them as well! A space secluded by black screens allows participants to enjoy privacy and the ceiling-mounted installation. The effect is one of being under water and gazing up at the surface. Hanging down are strings with small glowing creatures. Beside the bed in which you can stretch out to view the ceiling installation, there is a basket of glowing creature components, so you can add your own. For PULP, Emerging Writers would like to have poetry of various writers in the community around the themes of repurposing projected on a wall of the venue during the evening. A slideshow will run flipping through the poetry throughout the evening. Every child learns that ‘water flows downhill’, and ‘you can’t push on a rope’. However this installation seems to defy the laws of gravity, physics, and structural engineering. How can a rope hold up the top end of a long tube? Here the artists have used one of nature’s most resource-effective design approaches based on ‘tensegrity’. Tensegrity is a structural principle that uses isolated components in compression (usually bars or struts) that do not touch each other, and tensioned members (usually cables or tendons) that delineate the system spatially. The term ‘tensegrity’ was coined by Buckminster Fuller in the 1960s to refer to this “tensional integrity”. 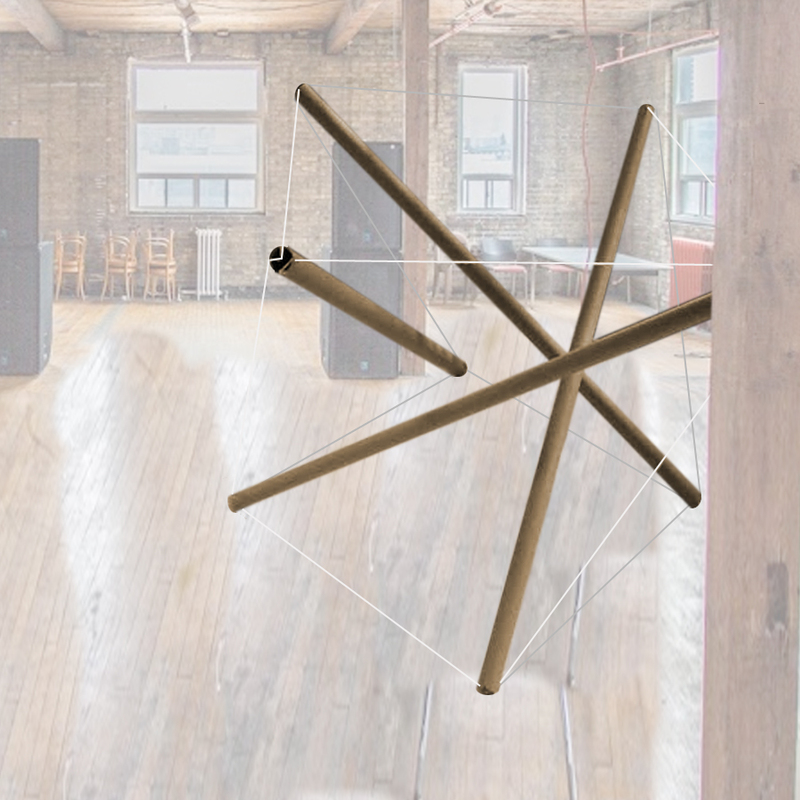 The tension-compression interactions of tensegrity minimize material needed, add structural resiliency, and constitute the most efficient possible use of space. Because the tubes never touch each other no complex connections are required to connect one tube to another. This design philosophy can produce exceptionally light but rigid structures out of these simple cardboard tubes and cotton rope. 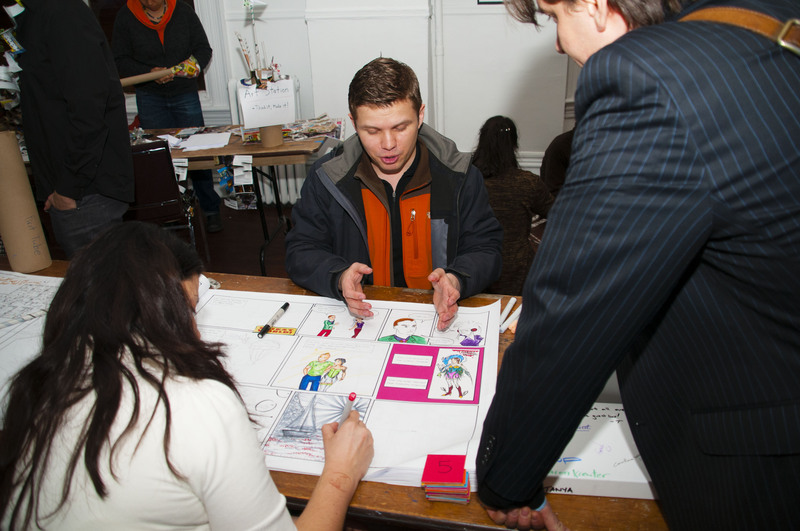 Hopefully others will be inspired to use resources more efficiently in their future design-build projects. “Like A Record, Babe” is a 3-dimensional mixed-media found objects installation promoting ocean conservation, which is composed entirely of materials found on streets (vinyl records, beer cans), discarded by peers (bubble wrap, coloured plastic beads, plastic six-pack rings), and/or in apartment/condo waste repositories (stand materials (cardboard, wood, newspapers/comic books/magazines etc. ); and materials left over from previous art shows (spray paint, . No new materials were purchased in the creation of this installation. The installation will be composed of three focal points, each displaying a different interpretation of sea life (an octopus, a squid, and jellyfish, respectively), composed of plastic, leather, fabric, and/or metal detritus which is built upon a spraypainted vinyl record. 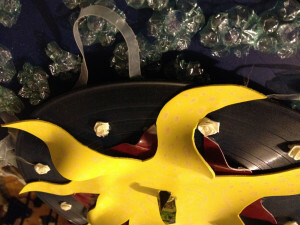 Each record is also affixed with cut-up plastic six-pack rings on the “b-side” – that is, the side which will be placed face-down on its respective base. Materials for the 3 weighted bases are still being sourced, but my intention is to construct them at varying heights between two and four feet, using materials such as discarded cardboard and wood pieces, adorned with an environmentally-friendly take on decoupage using discarded magazines, newspapers, comic books, etc., as well as painter’s tape, pushpins, and nails to serve as adhesive. Each of the three bases will also be fitted with an envelope stuffed with hand-written and illustrated note cards detailing family-friendly information about each respective form of sea life. Pulp Couture, is an elegant couture dress composed of recycled material. Fashion does not have to come with hefty price to our environment. Good design is what makes a piece unique while material, new or old, add beauty and character. Suspended slices of lemon made from recycled materials, are a sign of freshness and the warmer weather heading our city. I’m working on a modular sculpture which would really fit into the Pulp party’s themes of recycling/environmentally friendly art. As a printmaker and bookbinder, I’m interested in making paper out of nontraditional materials and then creating sculptures inspired by the material properties of those types of paper. Right now, I’m using the thin, flexible membrane which lines eggshells, and which contains the yolk sac of eggs. I’m asking people to donate their eggshells to me whenever they bake or cook and then gently peeling the bits of shell of the membrane. 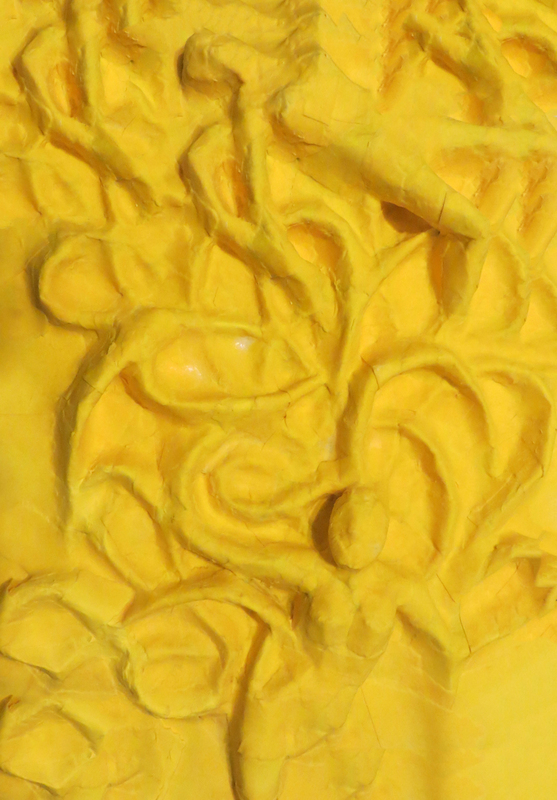 When it dries, it takes on the texture of very thin paper. The piece I’m making is connected to a series of work I’m doing that explore the notion of the skin as a text and the historical connections between bookbinding and cosmetic and reconstructive surgery. To get a stronger bond, I’m going to lightly glue the skins together with homemade wheatpaste, which is 100% biodegradable, so everything in the installation will be eco-friendly. This project combines sculptural aesthetics of Celtic design, the historical properties of paper, and the female form. I will construct a freestanding paper mache column from strong yellow card paper and a heavy matte medium mix. I was inspired to create this piece by historical documents about female Celts. In my research I discovered that the female Celts enjoyed much more freedom and power than their Greek or Roman counterparts of the same time period, however since Celtic art does not feature depictions of people the documentation is lost in art history. Where most of European antiquity treated women as second-class citizens, the Celts and Nordic cultures have presidents of female warriors, property owners, royal power as well as equality within marriage. By creating column capitals featuring a combination of interlace and female form I intend to present an image of the ancient female an integral part in history. The use of paper echoes the written word, rather than solely architectural representation and by creating from the page I would like to rewrite or create another form of historical artifact where the female form acts as the underlying component of historical progress. 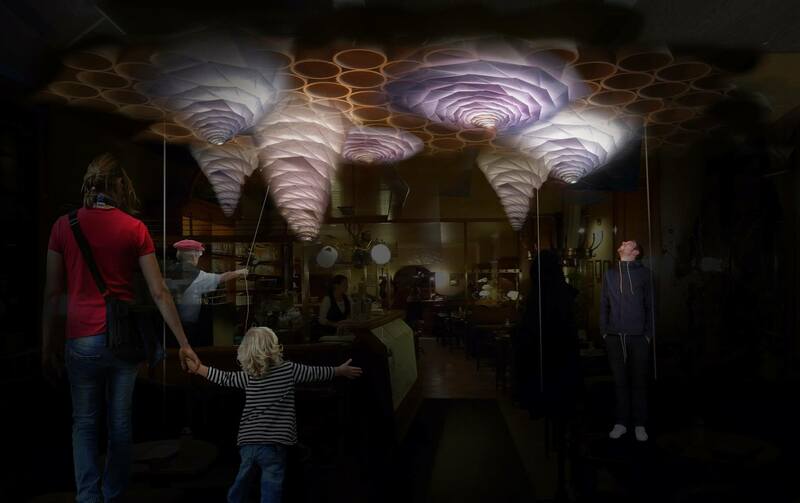 Our proposed installation is envisioned as a whimsical entrance to the Pulp Art Party. Functionally, it is a freestanding, additive element to the venue. It will create a momentary divide between the inside and the outside to heighten guests’ curiosity and anticipation. By reusing found materials, we emphasize and give materials new life with a design that asks guests to reconsider ‘traditional’ ways to use recycled goods. We want guests to interact with one another, and have fun, as our installation becomes an ever-changing entrance to the Pulp Art Party. For more about the event last year click here.